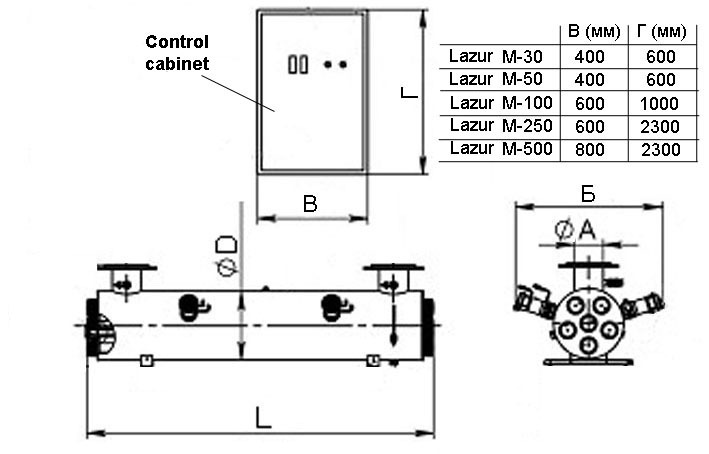 The units of "Lazur-M” series belong to the new generation of devices for the disinfecting of water and/or sewage by means of ultraviolet irradiation and ultrasound. These units are created based on conversion technologies. They are able to completely destroy pathogenic microorganisms and transform toxic organic compounds into safe neutral chemical substances. 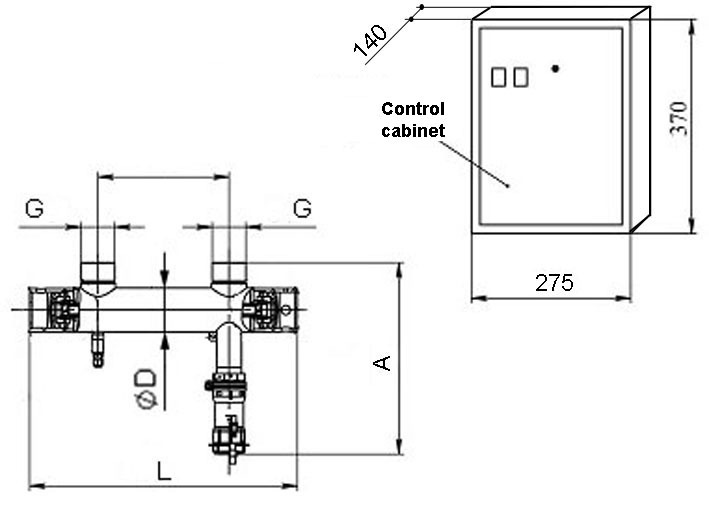 The germicide “Lazur-M” units make use the sources of continuous ultraviolet radiation in the waverange of 180 - 300 nm which forces on an aqueous medium after passing through the special material (suprasil). Simultaneously the aqueous medium is subjected to the treatment by the ultrasound that makes it possible to raise the disinfecting effectiveness of the units by 100 – 1000 times. This circumstance allows one to render harmless (to 0 level) microbiological admixtures at the initial concentration level of 106 units/l for bacteria and spores and of 105 units/l for viruses (including poliomyelitis viruses). Such disinfecting effectiveness is by many times higher than for analogous devices in Russia and abroad. 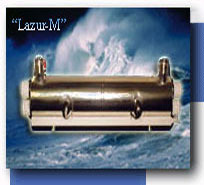 As a result, water after the treatment in Lazur-M type units satisfies the requirements of the best world standards. The use of ultrasound in the units in pint allows one to perform disinfection of highly mineralized water and to prevent the occurrence of the biofouling and solarization of radiators and photochemical reactors. 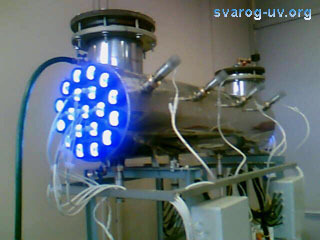 JSC SVAROG manufactures the units for treatment capacities of 500 l/h, 1000, 3000, 5000, 10000, 30000, 50000, 100000, 250000, and 500000 l/h. 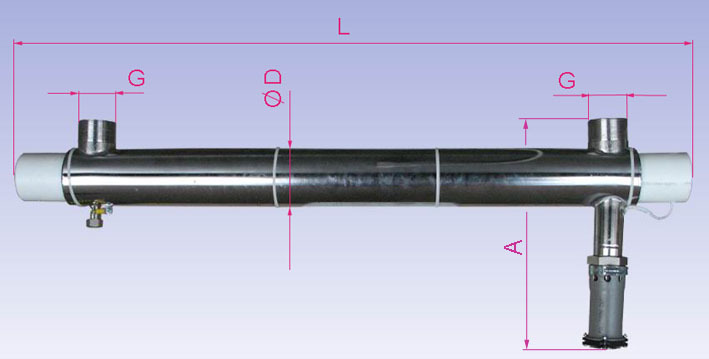 The service life of employed UV lamps is up to 12000 h. The amalgam type lamps characterized by the higher light output and longer service life (up to 16000 h). Attention! The above mentioned service life UV lamps is ensured under the condition that the number of switching on/switching off operations is not greater than 2 times per day and not greater than 1000 times over the warranty period. In the systems of economic and drinking water supply for living settlements, cottages, etc. In the systems of recycling water supply for the disinfection of water in swimming pools and baths. For the disinfection of sewage at agricultural enterprises, at the companies producing beverage foods, in meat-and milk industry, etc. JSC SVAROG produces also "Lazur-USV" unit which is designed for demineralization and disinfection of the mineralized water to achieve the requirements specified in SanPiN 2.1.4.1116-02 regulations with regard to the content of suspension and organic substances and the content of chlorine and iron as well as with respect to organoleptic and microbiological characteristics. All the units satisfy the requirements of the American National Standards for the ultraviolet disinfection of water ( NSF / ANSI 55-2004 ). 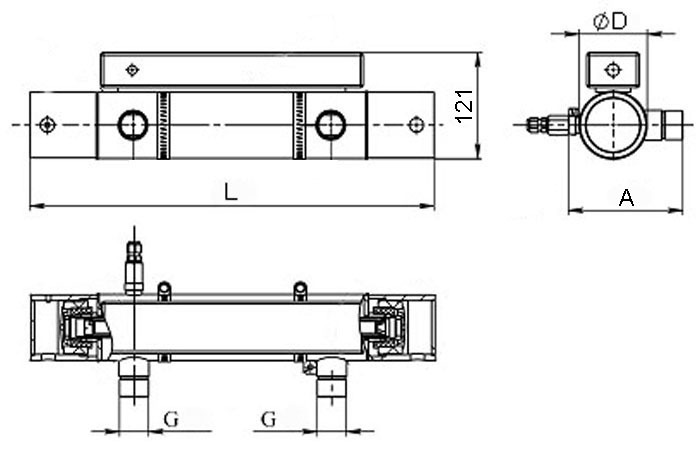 The units of greater capacity are combined from the modular units designed for capacities of 50, 100, 250, and 500 m3/h . The stations of the disinfecting of potable water for the capacity from 100 m3/h to 10 000 m3/h are also produced.